British Labour Party leader Jeremy Corbyn at the 'No More War' event at Parliament Square in August. Israel’s Foreign Ministry Spokesman Emmanuel Nahshon slammed Human Rights Watch (HRW) after one of its senior officials lent support to anti-Semitic conspiracy theories involving Israel. Sarah Leah Whitson, Executive Director of the HRW Middle East and North Africa Division, on Sunday retweeted an article published by the Electronic Intifada, a virulent anti-Israel site, which claimed that Israel was running a campaign against Labour party head Jeremy Corbyn in the United Kingdom by drumming up accusations of anti-Semitism against him. In her retweet, she wrote “Why is this Israel interference in domestic UK politics acceptable? Is it only a problem when Russia does this?” relating to alleged Russian meddling in elections in several countries. Corbyn has been mired in anti-Semitism scandals and accusation of support of terrorism since taking the helm of UK’s biggest opposition party. 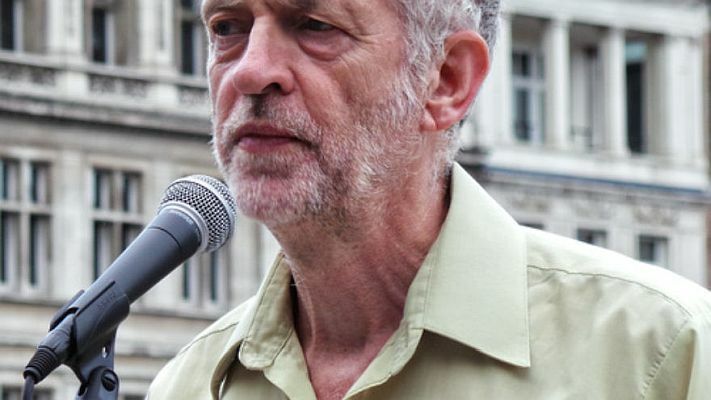 A 2018 poll found that 86 percent of British Jews, and a majority of the general British public, believe Corbyn is an anti-Semite. “Obsessive hatred and conspiracy theories worthy of the worst anti-Semites,” he charged on Twitter. Whitson later claimed that “some friends on Twitter have said they think my tweet is open to misinterpretation and bears clarification” and that her tweet “commented only on the Israeli government’s problematic promotion of an app in the UK.” She was relating to a pro-Israel app which Electronic Intifada claimed was connected to the Israeli government, an assertion she accepted without question. HRW has incurred broad criticism for its anti-Israel stance, while its activists have called Israel an apartheid state and promoted anti-Israel boycotts. HRW has issued reports claiming businesses operating in Judea and Samaria contribute to Israel’s violation of human rights and has called on them to cease their activities there or face boycotts. HRW has also published several reports that were highly critical of Israel, especially after wars or periods of clashed with Gaza-based Arab terrorists. It accused Israel of committing war crimes during a counter-terrorism campaign against Hamas terrorists in the Gaza Strip in the summer of 2014. Israel has rejected the findings of the reports.